Audio card USB PRODIPE STUDIO 22 +, USB AUDIO Interface: equipped with combined XLR/Jack input, stereo USB input and output, stereo output for monitoring and separate headphone output Usable with CUBASE, PRO TOOLS or any other software. Asio driver ready. With Prodipe, as per usual, it's all about the music and the musician. At unbeatable value for money, the Studio22+ USB audio interface faithfully carries on the Prodipe tradition. Whether you use it for recording, home studio work or live performances, at only €89, the Studio22+ is absolutely essential for music lovers, amateur musicians and professional musicians. 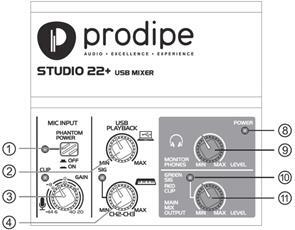 The new Prodipe Studio22+ is a first-rate audio interface for Mac and PC. It comes with a USB DAC (digital to analogue converter) and the Prodipe driver, ASIO 2, for near-zero latency (less than 1 millisecond). Equipped with combined XLR/Jack input, stereo USB input and output, stereo output for monitoring and separate headphone output. Included is a high quality audio chipset for creating recordings that are ultra smooth and exceptionally warm. But the Studio22+ is also self-contained, so your mics, instruments, monitor speakers and headphones can all be plugged in directly. Two of you want to perform live and record yourselves at the same time. Use Studio 22+. You want to play your electric guitar and sing at the same time, but your amp has only one input socket. Use Studio 22+. You want to play better by listening to yourself through headphones. Use Studio 22+. You want to use two mics with your acoustic guitar, but your amp has only one input socket. Use Studio 22+. One balanced XLR combined connector (13) and balanced Jack (14). Phantom power with ON/OFF switch and LED indicator (1). Dual 6.35mm Jack socket (balanced/unbalanced) (12). Volume knob with LED signal indicator (SIG) (4). One stereo BUS channel (from Mac or PC). Dual Jack socket (balanced/unbalanced) (5). "Hi-Z" line/instrument impedance button (15).